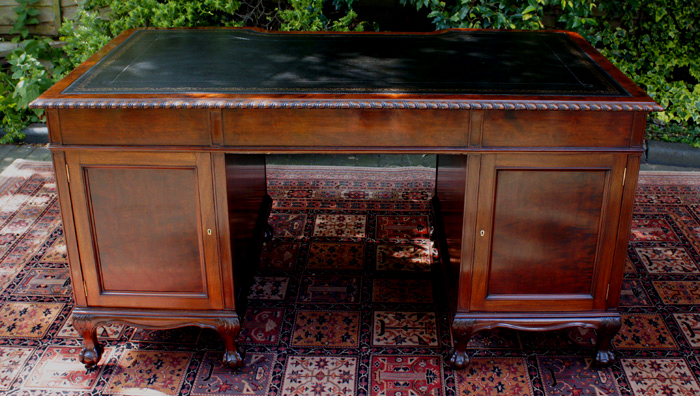 A beautiful antique Gillows mahogany desk made from the best quality figured timbers in the Chippendale revival style. 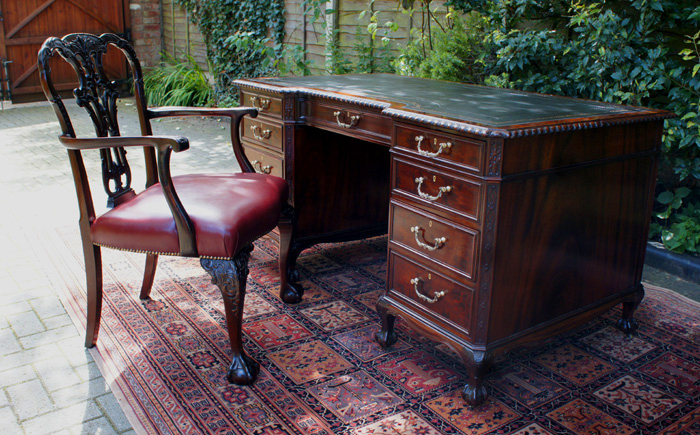 The desk has recently been restored including french polishing in the traditional manner and has a new black hide writing surface with gilt and blind tooling. The top has a break front design with with a carved dragoon border. ​Below there are three drawers with mahogany linings, hand cut dovetail joints and the original locks and key. The front edges of the drawers have a beaded mould and are fitted with the original ornate cast brass handles and escutcheons. and has a new black hide writing surface with gilt and blind tooling. The top has a break front design with with a carved dragoon border. Below there are three drawers with mahogany linings, hand cut dovetail joints and the original locks and key. The front edges of the drawers have a beaded mould and are fitted with the original ornate cast brass handles and escutcheons. Either side of the kneehole are pedestals each with three drawers and with canted corners with blind fret carving. To the reverse of the pedestals are cupboards with panelled doors and a fitted shelf. The desk stands on short, carved, cabriole legs, four per pedestal, with the original brass castors. 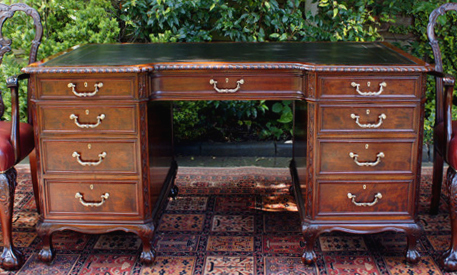 This pedestal desk is made in one piece from superb quality solid mahogany timbers. It was probably made to order and is a rare piece of furniture of outstanding quality. This desk is made to the highest standards of commercial cabinet making and is stamped on the bottom edge of the middle drawer (L58980). The Gillows job number the L represents Lancaster, and dates the desk to 1878. Gillows only name stamp approximately 40% of their pieces of furniture and many others had a job number as with this desk.